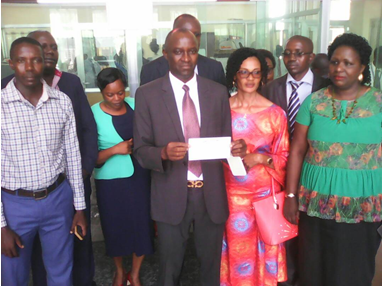 BUJUMBURA May 21st (ABP) – The AWA (Abahanza world association) paid on Wednesday to the Central Bank of Burundi a contribution of 14,000,000 BIF to the 2020 elections. According to Alfred Innocent Muselemu, one of the founding members of the association that spoke on behalf of others, the gesture they had just made is a response to the appeal launched by the President of the Republic who invited any patriotic Burundian to contribute to financing the 2020 elections. He made it clear that the contribution to the elections is a civic act which contributes to the strengthening of the independence of the country. At a time when external donations are often accompanied by conditions that violate sovereignty and do not respond to the interests of the country, domestic financing of elections shows that Burundians are able to self-finance, hence he invited all citizens to make a gesture of the kind. According to Mr. Muselemu, the AWA is an apolitical association, made up of men and women from different backgrounds, various political parties and even without political affiliation.